Respect the land, water, wildlife, plants, and other people. Steep Rock offers a wide variety of River Recreations for the dedicated fisherman, a hobbyist or a family out looking for some quality time. Spend your day with us and enjoy the wettest part of nature. Our Preserves offer a special place for both the solo angler seeking a peaceful retreat and the family excited to create lasting memories together. Help us continue to allow public fishing in our Preserves by following the rules listed below along with our preserve maps. Steep Rock Association preserves land surrounding 6 miles of the Shepaug River at Steep Rock and Hidden Valley Preserves. The River provides a peaceful backdrop to hiking trails, and also the opportunity for a paddle when the water is high enough. 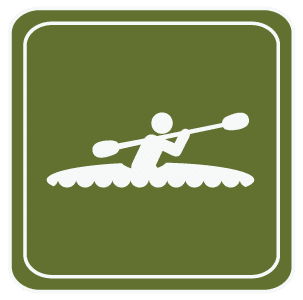 Non-motorized boats can enter the river at a number of locations marked on our trail maps. Please note: By fishing in our Preserves, anglers acknowledge understanding of and adherence to these Fishing Rules. Help wildlife! Bring all your discarded fishing line back home with you so wildlife is not ensnared in it. Locating and following posted signs is the angler’s responsibility. Fishing privileges are at the discretion of Steep Rock Association. Outings coordinated by nonprofit organizations or community groups are approved only in the sections not marked “restricted fishing” via a Day Use Permit from the SRA office. Know and follow CT fishing regulations. Daily creel limit for trout is 1 fish. Catch & release fishing is encouraged. Public fishing is allowed in sections of Steep Rock and Hidden Valley Preserves that are not marked as “restricted fishing”. There is no fishing at Macricostas Preserve. All passengers on boat must have a life jacket or personal flotation device. Please no cutting of woody debris in river. Launch boats from designated spots marked on trail maps. To prevent the spread of invasives please ensure all boats/equipment are cleaned prior to boating.